This is not my blog. I have picked it up from Robin Cook’s Author’s note from his novel Mindbend. Read the bitter truth below. Since I graduated from medical school in 1966, 1 have heard the term “crisis in-medicine” so often that it conjures up the allegory of the shepherd boy who cried wolf too many times. But until now the crises have all been voiced by particular interest groups and were often contradictory: too few hospital beds, too many hospital beds; not enough physicians, too many physicians. It was enough to make anyone confused and apathetic. But now I have come to believe that “crisis in medicine” is applicable in a truly general sense. Unfortunately, because so many people have cried wolf in the past, the media have only just begun to take note of this very real crisis. What we are witnessing today is the gradual but quickening pace of the intrusion of business into medicine. It must be understood that the corporate mentality of the balance sheet is diametrically opposed to the traditional aspects of altruism that have formed the foundation of the practice of medicine, and this dichotomy augers disaster for the moral and ethical foundations of the profession. Big Business views the medical field as a high-cash-flow, high profit, low-risk, and low-capital investment industry that is now particularly ripe for takeover. Evidence of this shift toward business interests in the medical field is reflected in the newly interlocking ownership of proprietary (for profit) hospitals and nursing home chains, medical suppliers, and a deluge of other health-care organizations like dialysis centers,surgi-centers, etc. Even research has gone in the direction of business as evidenced by the new biotech companies. Response to this activity has been surprisingly slight, despite the insidious effect it has on the practice of medicine. Professional journals have viewed the process with curious academic disinterest, doctors have either joined the entrepreneurial bandwagon or ignored it, the public has remained silent, and the media have only just begun to run articles sounding the alarm. It is my hope that Mindbend will help focus public attention. By couching the problem in an emotional framework, it brings the process into personal perspective and allows the reader to understand the implications of the situation through identification with the main character, which I believe is one of the key values of fiction. For me, the realization of the intrusion of business into medicine came with a letter I received from a hospital, informing me that its census was low and that I should admit more patients for surgery, as if I had a group of people in the wings who were being denied appropriate operations. That letter, more than any other experience, made me realize that our medical system had inadvertently been constructed to depend upon and reward of facilities and services, thereby fostering its own rising costs. No wonder businessmen became interested. For Mindbend I chose the drug industry as the focal point not because it has been any worse than any other group, but because it has been around longer than most businesses associated with medicine and it exerts a powerful and growing influence. The important point is that the drug firms are corporations which do not exist for the public weal, no matter how much they try to convince the public otherwise. Their goal is to provide a return on their investors’ capital. The overriding commercial interest of the drug firms is underlined by the ungodly amount of money (billions of dollars per year) that they spend on promotion of their products, primarily attempting to influence the physician, who unfortunately is rather easy prey.There are very few doctors who have not accepted some gift or service from the drug industry. I still have the black bag given to me as a third-year medical student, and I have attended a number of symposia sponsored by a drug company. It would be unfair to suggest that the pharmaceutical industry has not contributed to society. But this has been the by-product, not the goal. The drug industry currently spends more on promotion and advertising each year than it does on research! According to Pills, Profits, and Politics, the amount is also more than the total spent on all educational activities conducted by all the medical schools in the United States to train medical students. It would be unfair to suggest that the pharmaceutical industry has not contributed to society. But this has been the by-product, not the goal. And there have been cases in which the public good has been ignored. One need only to mention the thalidomide disaster or the DES calamity to recognize that the record is variegated and that commercial interests can have unfortunate consequences. Drug companies have marketed products that they knew might be dangerous or ineffective or both merely to turn a profit. Medical practice as it has been known in this country for the last thirty years or so is changing. The doctor-patient relationship used to be the fulcrum, but it is losing ground to economic and business interests. The American public has a right and an obligation to know what kind of system is evolving. Ainsworth, T. H., M.D., Live or Die (Macmillan, 1983). Written by a physician who looks at the problem from the vantage point of having been both a practitioner and a hospital medical director, this book is particularly poignant in its appeal for physicians to recognize what is happening to the profession and to reexert their leadership. Silverman, Milton, et al., Pills, Profits, and Politics (University of California Press, 1974). This book gives an overall view of the pharmaceutical industry, and it makes for interesting reading. I’m confident it will arouse some unexpected emotions. Although it was written over ten years ago, it is still strikingly relevant. Starr, Paul, The Social Transformation of American Medicine (Basic Books, 1982). This book provides an impressive overview of the history of medicine in America and gives one a realistic comprehension of how the current situation has developed. The world is up for sale. The highest bidder wins. Well, I guess that is the situation we are in now. Next time, do not be amused if you get diagnosed for appendicitis for a complaint of running nose. For all you know, you will help the business to achieve their target for the month. Medicine used to be a noble profession, not anymore. You need to cover for the huge capitation fees you paid for your degree. No one likes an MBBS, you need to be an MD and half a page of qualifications in your letterhead. How else will they recover their expenses. It takes a long time to just break even. But hey, you will still find that silver lining. Just keep looking for it. As of now, money rules and it is an addiction for which there is no cure. Should I root my Android Device ? I am supposed to be a techie and work for a techie company supposedly with a lot of techie folks doing a lot of techie things. I like to keep myself updated with latest gadgets and innovations in technology especially mobiles, cameras and lenses. My first mobile phone was a Samsung Galaxy S2, which has served me well and a great phone then. What got into Samsung after the runaway success of this phone is bizzare and demands a separate discussion altogether. Anyway, back on topic, it sure raised a lot of second glances from my colleages and even bosses, but a vast majority did not even know that it was an Android phone. Needless to say, I had to explain it to them and in the process, end up knowing a lot about Android myself. One of the very basic questions which my colleagues and friends ask me even now is “Should I root my phone” ? 1. Install / Uninstall “ANY” apps. Does OEM provided NEWS update “feature” consume too much of your data ? (It did atleast for me with my S2 intially). Does certain OEM applications ensure your phone never rests peacefully, running unwanted background processes ? Does your carrier restrict certain applications to be installed on YOUR phone ? Does Playstore let you know in no uncertain terms that certain applications are incompatible with your phone (What do they know ?). Rooting gives you complete control on all of this. It is your phone and it should be your responsibility to make it or break it. Who are the OEM’s to dictate terms. Android is an open source OS and rooting lets you unleash the beast within. 3. Automate anything you want. You must have heard about an application called Tasker. If you haven’t, well look it up. It can automate a lot of tasks customized to your needs. It works great with unrooted phones. With a rooted phone, it scales a completely different level. Just imagine WiFi turning off automatically once you leave home and turning on the moment you are back in. This is just a very basic tip of the iceberg feature. Check THIS beginners guide for more information on this awesome app and how rooting really brings out the best with Tasker. 4. Improve performance and battery life. You can do lots with an unrooted phone, but rooting gives you that extra control. There are fantastic apps available (SetCPU) for rooted phones in PlayStore for underclocking and overclocking the CPU on a need basis. Greenify can hibernate apps not needed. BetterBatteryStats works wonders for improving and diagnosing battery life issues. Almost all flagship’s hardware is more or less same, but the performance and battery life is dictated mainly by the skin and apps installed and configured by these OEM’s and a rooted phone gives you complete control of these applications and configuration. 5. Remove ads and bloatware. Do you get irritated with those annoying “Please Click Me” type ads when playing your favorite supposedly free version with hidden ingame bombs. Do you really find it difficult to locate that small x of a mark to close these ads. You can always switch to Airplane mode or turn data off on unrooted phones 🙂 or root your phone and install adblock applications and good riddance to these ads forever. 7. Get a custom kernel / ROM. Be warned, with great power comes great responsibility. You can install a custom kernel, but do not tweak it if you have no idea what it does. Most of the under the hood tweaks need a custom kernel. In addition to providing a much better performance and battery life, Kernels are the interface between your device and the OS. Ok, lets assume you know what you are doing, you can do a lot of system level tweaks and even enable features which is claimed unsupported by the manufacturer. A perfect example would be WiFi tethering and hotspot. Custom ROM are in plenty for you to explore and find that perfect OS which will suit your needs. 8. Get support for out of support handsets. This deserves a separate blog. 11. Have you heard of Cerberus or other such apps ? It is easy to lose a mobile phone and more often than not, it will fall in the hands of someone who will be attracted by this little “extra” income. How many anti-theft solutions have we encountered, just to realize that by the time you discovered your loss, the phone is clean and untraceable. Maybe you can get the last known location. Cerberus and other such apps, enable you to install their anti-theft mobile tracking application as a system application and gets installed in the system partition. No matter what the thief does, these applications cannot be uninstalled. They also reside in the system partition with simple non-suspicious names. Even a factory reset and wipe all data will not uninstall this application. You guessed it right. You need a rooted phone for this. However, if the thief is tech savvy and he decides to flash a fresh ROM, bid your phone goodbye as no one is interested anymore in trying to help you get your phone back. We wanted to move on with the rest of our Journey, anyway we will watch DWF again tomorrow on our way back won’t we. Meanwhile, I enquired and someone informed me that Goa bound Amaravati will be in shortly. How can I come back from DWF without taking the trademark shot of train on the bridge with the Majestic falls as the background. There were 2 options, the first one is the typical shot which we would have all seen across the web. 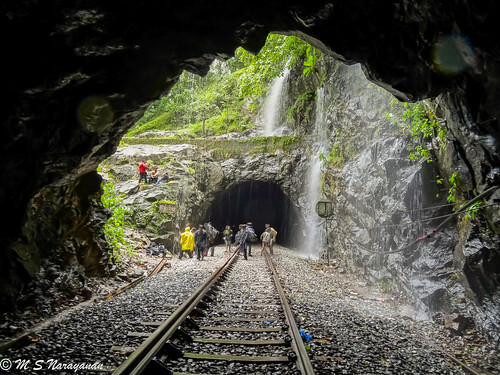 The second option, there is a small trail which will take you down between the 12th and the 13th tunnel and you can get a beautiful position to capture the train from below. You can get the train, bridge and full view of the falls from somewhere under the bridge. I did not know how long it would take for me to reach there and would be cross with myself if I would miss the shot and hence decided to take the sure shot capture typical seen all over the web. We rushed through the tunnels, ( atleast I did for sure ) with our fully loaded backpacks and sleeping bags. My SLR was hanging from my neck and the rain jacket was keeping it safe and my PS was in my left jacket pocket ready for quick release and shoots. I could not believe that I trekked that 1 KM in less than 7 minutes and I could see the viewpoint about 100 metres ahead. 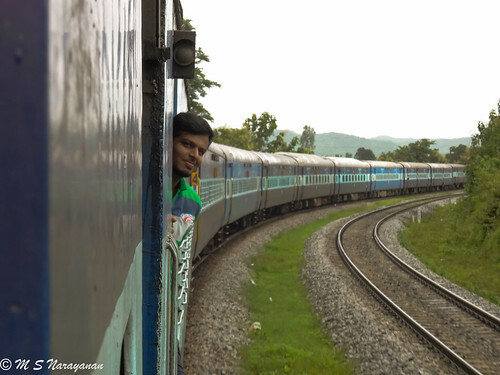 As the excitement was getting to my head, I heard the distinct horn of Amaravati express. I really had no choice, but to capture the train from my current viewpoint. Even though I would have liked to take the snap 100 metres ahead, I ended up taking from where I was and was good enough, though not the exact way I wanted it to be. 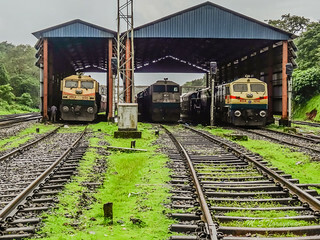 After all trains are the kings here and you have to bow to them _/\_. 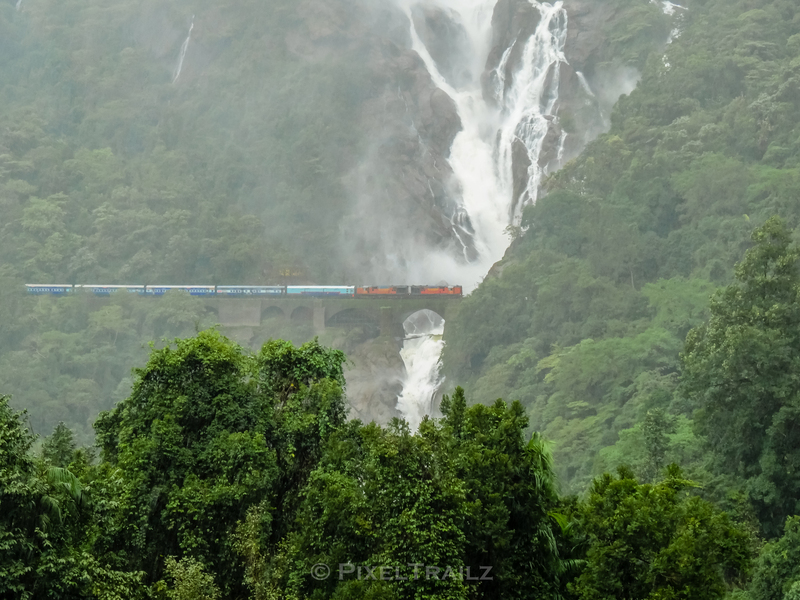 Boy, I always wanted to click this Amaravati express crossing the majestic Dudhsagar falls — at Dudhsagar Waterfall. 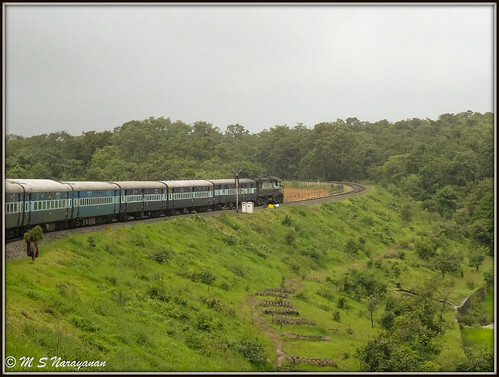 Headlights on Twin Gooty Baldies with Amaravati express in tow sneaking in through the greenery — at DDS. Nothing to say. 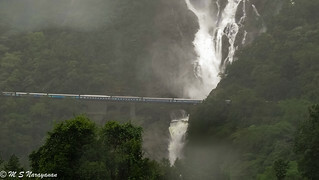 Amaravati Express — at Dudhsagar Waterfall. Mission accomplished. Amaravati went past the falls before my lens, and crossed us in less than a minute. Time to move on. Next stop Sonalium to take stock of our situation and decide what to do. Next 40 mins went without any talk as we quickly moved towards Sonalium. 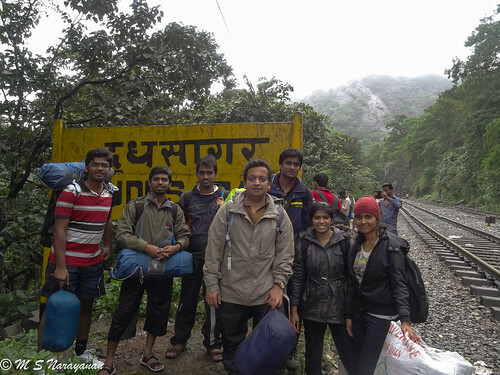 On the way, I found quite a good number of trekkers trekking up from Kulem towards Dudhsagar. One trekker caught my attention, who was actually carrying another trekker on his back. Did not bother to stop him and ask, but looks like one of them had a twisted ankle. Trekking down with my backpack was labor enough for me and just could not imagine doing something like this. In reality if you see our mind is so strong, that you do not realize how strong you can be when being strong is the only option left for you. Our body always has a fight of flight mechanism to fight infections, but a human mind always fights when there is nothing else left. Anyway, I am drifting and we reached Sonalium without incident around 2:30 PM. A quick headcount and analysis of the situation revealed that majority would not be able to trek upto Kulem which would be another 8KMs. We took a short break in front of the SM office and energized ourselves with chocolates. Based on the Junior SM’s instruction we waited about 50m down the line awaiting a freight to take us to Kulem as one is expected shortly towards Kulem. It so turned out he was right and we heard the distinct EMD horns and saw the mid-level headlights approaching towards us, but the triplets did not have anything behind them. Light triplets. All of us waved to stop, the LP reciprocated, but did not stop. Disappointed and tired we requested the SM to stop the next one towards Kulem and this is what happened. A few got really irritated with his style, but 2 mins later the Senior SM whispered something into his ears, which was passed on to me by him like a Chinese Whisper. The message was Engine signal mein ruka hai crossing ke liye. Jaldi jaao aur LP ko pyaar se poochna. Yeh mat batao ki maine bataya. Chup chaap Nikal aur sabko mat batao. Bhaag saala bhaag and I suddenly took off like there is no tomorrow and seeing me others took off mainly to ask me what went wrong. I could hear concerned cries andshouts behind me, but I was a man on a mission. I could see the triplets waiting for a signal. The last 100 metres were the most difficult, Did not ask anyone, just boarded the last Loco and waved at the LP, who did not mind. 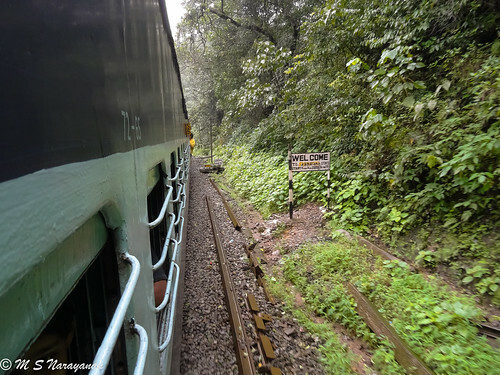 In the next 5 mins, there were a total of 57 people on the 3 Locos. The LP came out and gave us instructions on how / where to sit / stand and asked us to be careful. Shortly afterwards, loaded BOXN rake crossed us and we were given the all clear. With the terrific notching up and humming behind me, we left towards Kulem and I can guarantee that everyone onboard was thrilled and excited. After 25 mins of meandering and tunneling and waving to all the bikers from Kulem to DDS, we entered Kulem. LP gracefully stopped for us near the station and moved on after ensuring all of us are safe and sound. 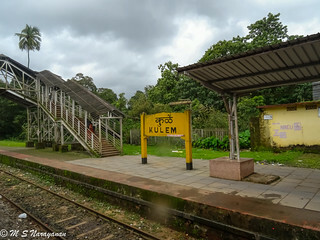 Atlast we are at Kulem — in Colém, Goa. A couple of our teammates are regular trekkers and getting them along was one of the best decisions I have made in my Project Management career. A few calls later we were informed that 3 Jeeps would come and pick us up from the station in another 20 mins and bang 5 mins later we had them at our disposal. We are not used to such extreme efficiencies and completing something committed in 25% of the time and hence we decided to make the station chaiwala prepare some fresh tea and ensured that we were ready for the Jeep only 20 mins later. We knew we were going to an abandoned house thats all and had no idea where it is except for the 2 folks who have been here earlier. Resting & Freshening up time !! 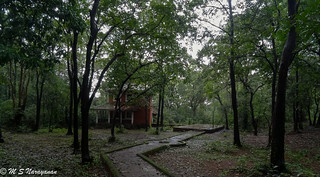 — in Colém, Goa. All of us left around 24 hrs earlier. 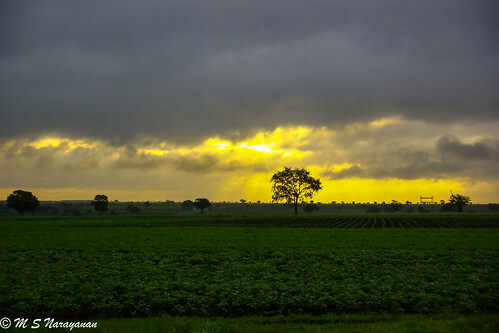 We were drenched in the rains with sun peeping up every now and then. 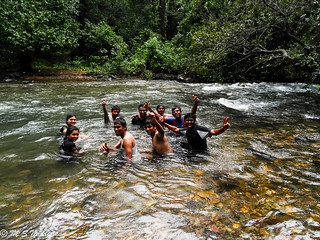 All the hike / trek / EMD emissions / sweat / train etc made us desperate to have a nice refreshing bath. Finding a working bathroom in an abandoned house seemed to be wishful thinking and so I asked our driver..Kuch Naha dhoke fresh hone ka option hai ? and our over enthusiastic driver responded with a resounding yes and we are all extremely happy that we would be able to freshen up. Imagine another 36 hrs without an option to freshen up..oops a scary thought. 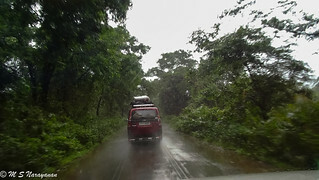 Enroute to Bhagwan Mahaveer Sanctuary and Mollem National Park — at Mollem. 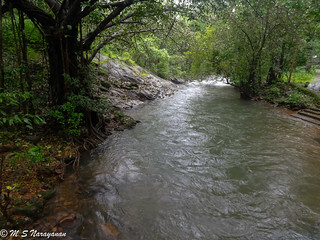 A stream enroute to Bhagwan Mahaveer Sanctuary and Mollem National Park — at Mollem. 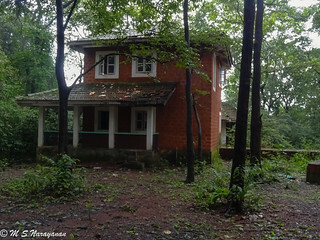 The abandoned house where we stayed for the night — at Bhagwan Mahaveer Sanctuary and Mollem National Park. Almost 5:30 PM now and light quickly fading, we decided to pitch our tents outside for those who want to spend the night outside and surprising we pitched them up quite quickly. Around 7 tents in about 20 mins. When we tried to get a campfire up and running, well it was a disaster and we decided to have the campfire with our flashlights. Freshening up needed desperately.The driver had mumbled something about bath facilities..and we went looking out and right beside our house we found it. It was a lovely knee to chest high deep running stream with an extremely heavy flow especially in the middle of the stream. 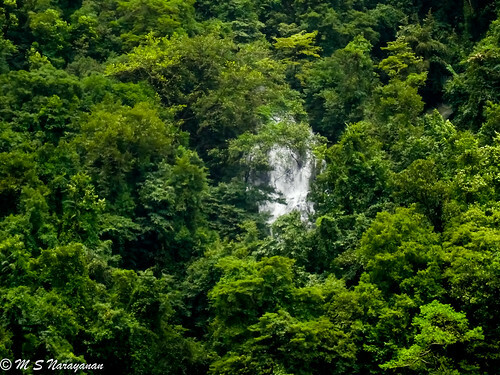 It apparently originates from a waterfall called Surla waterfalls, to which we will trek in the morning. The bath lasted around 80 mins. I have never had a more refreshing bath ever in my entire life. 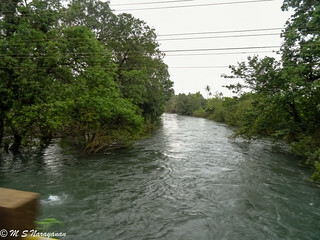 Fresh clean running water amidst heavy rainfalls. Absolute pure divine and heavenly bliss. 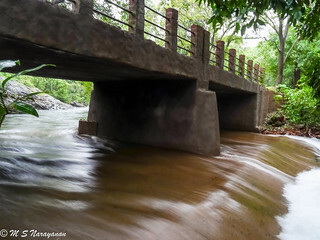 It was a good time for whoever was interested to have a nice chat session in them middle of the stream which must have been around 70-100 ft wide. By the time we finished our bath (The only reason was it was dark .. ), a few of us had cleaned the rooms. Now the floors are visible, sanitized with dettol, sleeping mats arranged and all set to have a cozy dinner session. We had got about 5Pkts of WAX Candles, each packet can boil 3 litres of water to the boiling point and a small stove for boiling water. Dinner consisted of Maggi, Cup-O-Noodles, Chapatis, Parathas, Bread, Jam and pickle. Water for drinking and cooking was from the stream, which I should say was amazing and true mineral rich water. Sleeping in the forest was a first time experience for me. 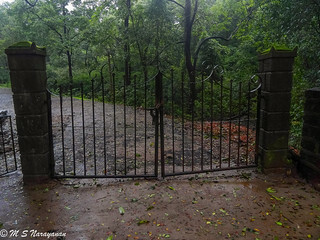 The night was absolutely silent except for frequent bouts of heavy to very heavy rainfall, however the huge canopy of trees ensured that the ground had not become extremely soggy as they had absorbed a whole lot of the rains.This is going to be a very hectic day and hence we decided to act quickly. Quick rounds of freshening up and changing to appropriate clothes and we were ready by around 7:30 for the final trek of the trip. 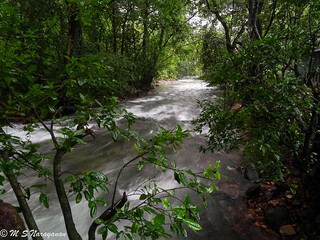 The trek will be to a place called Surla waterfalls from where the water actually flows down to the streams where we had our bath the previous evening. 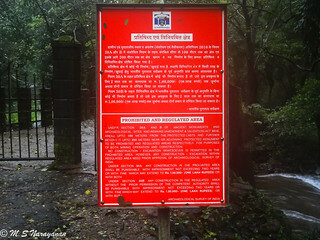 This trek was much more difficult than we had expected. We walked along the streams with a steep ascent. There were more than 4-5 occasions where we had to cross the stream to ensure we were on the right path. Crossing the streams were much riskier than we had thought. 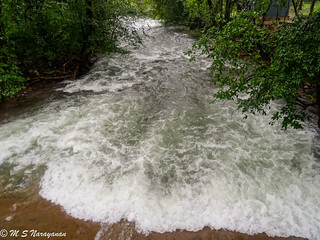 The water flow was very high and the uneven surface at the bottom ensured that we had to tread very very careful lest being washed away. Fortunately the water was crystal clear and we were able to judge the depth slowly and steadily. The standout crossing was one stream where we had to actually climb a branch and crawl across it to the other end. An adventure worth the risk, but very slow considering the fact that only 2 of us were able to cross at one time or else the branch would break. Almost an hour of trek and 4 kms later, a few of us felt that we had actually missed the trail and decided to turn back to the base camp. The remaining decided that we would carry on for another 15 minutes and will turn back if we do not reach the peak. All I could say was those who turned back were just plain unlucky for 2 reasons. The first being, we reached the falls in about 5 minutes and second, they missed a sight which was absolutely phenomenal. 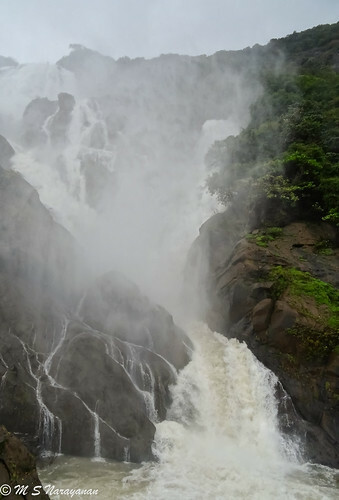 The falls was nothing in comparison with Dudhsagar, but the surroundings, flow (Which was quite strong) and the mere fact that was absolutely not a soul in sight was a reason in itself that this was indeed special. 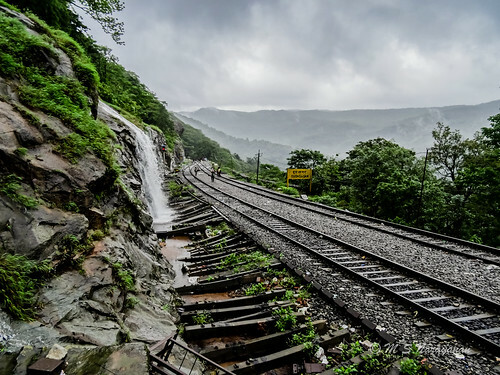 The only regret was that there were very very few cameras on board for this trek as we were sure of getting drenched head to foot. There is very little I could do than just relive the memory. About half an hour of stay at the falls, numerous leechbites and half a mind to stay back for another week, we turned back to our base camp. The return was swift and we were back in about 40-50 mins. It is around 11:00 AM now and the Jeep is supposed to pick us up by 1 PM to drop us back at Kulem. So off we go, quickly pack the tents, sleeping bags and collect the trash, but there is one more thing left to do. 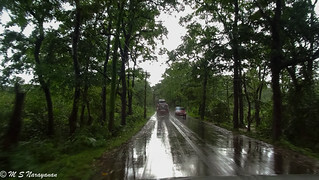 Yes, you guessed it right, another 60 mins of pure bliss in the stream in the rains. Another refreshing bath and we were all ready by 12:30 to get back to Kulem. 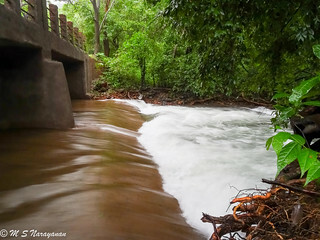 By now this area has become a tourist spot and considering the fact that it was a Sunday, there was a small crowd who had come to enjoy the streams and a visit to templ close by. While, the previous nights bathing experience in the stream was absolutely private, it was not all the secluded and private this morning. But who cares, we had a great time again nevertheless. Being a tourist spot, we treated ourselves to steaming hot chai and vada pav. A visit to a lovely quaint and small temple inside the forest and we were all ready for the pickup for on our way back. 1 PM was the pickup time, give or take about 15-20 mins. No sign of the Jeeps till 1:30. Well, nothing to worry, Kulem is just about 20-30 mins by Jeep and our train is at 4:20 PM. It is 2:00 PM now and no sight of the Jeeps. We started cursing ourselves that we should have given those folks only about 25% of the fare instead of 50%. We started discussing alternate plans of reaching Kulem. While we would have loved to stay back for another day, it was not all that appealing considering that we have to be at work the next day. 2:30 PM now and still no sign of the Jeeps. Oh my god, we would now have to skip lunch which we decided to treat ourselves at Kulem. We were getting hungry and the Vada pavs seems to have been fully digested. 2:45 PM : No sign of Jeep. Panic sets in. Plans discussed. Extreme measures brainstormed. Just so you know the Climax, We indeed boarded Goa express back to Bangalore, but the final scenes have not yet been shot. Still no signs of the Jeep. We are unable to call the driver as cell towers are out of reach. 2 of us dropped our baggage and decided to take a hike on someone’s vehicle to the nearest location where we could manage a mobile reception. So off we go in search of a signal to call our driver. 5 mins into the drive, we find our 3 Jeep folks rushing in. We did not even bother to ask them for any reason. Quickly all are luggages were loaded and we were zipping towards Kulem. 30 mins later we landed at Kulem level crossing to allow a penta header to cross. I did not feel like waiting for the gates to open and walked to Kulem station. 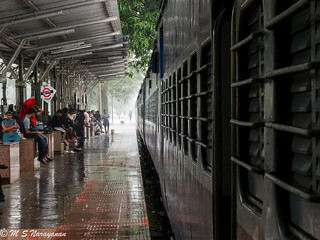 Train in Rain. Vasco – Kulem passenger. 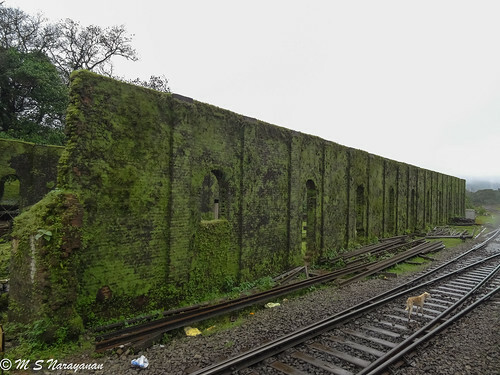 Vasco – Kulem passenger had just arrived and the station was just the opposite of what we found the previous day. Extremely crowded with heavy rains made walking through the station a bit difficult. I saw a number of passengers skidding on the platform. 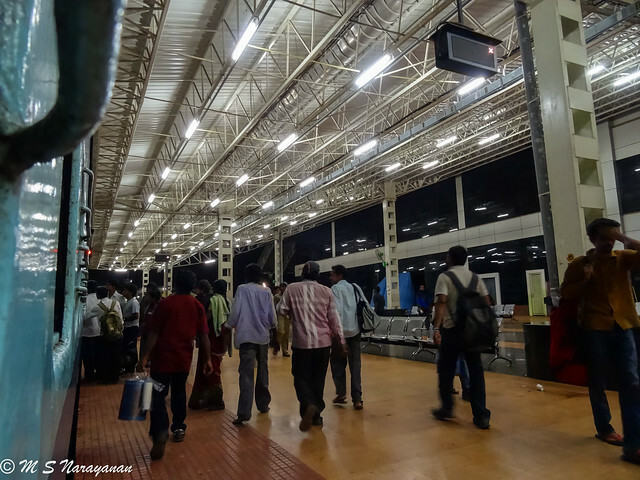 As the Bangalore link coaches would be at the last, I started walking slowly towards the end of the platform, which in hindsight was an excellent decision. Now that we have another 35 mins for the arrival of our train, based on a localites suggestion we decided to cross over to the other side of the station and order fresh hot cooked biriyani for our dinner. We placed our order and the restaurant owner decided to walk out by 4PM. Fortunately he was back in around 5 mins and we just reminded him of our impending train journey. The man, with absolute serenity and peace with himself started washing and cutting the vegetables he had just got. “Arey madam kyun tension le rahe ho, gaadi panch baje ke pehle tho nahi aayega. Udhar bait jaao aur garma garam biriyani banake detha hoon. Station me jaake baaki logo ko bhi bol do yeh apna biriyani mast hai”. 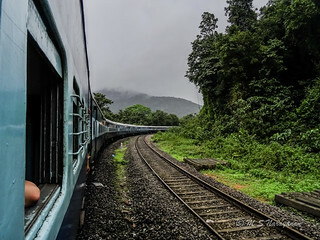 We did manage to get 18 packets of biriyani packed, hot and fresh and managed to make it near our coach by around 5 PM and we saw our Goa express curving into Kulem just in time for us. S13 was crowded with loads of folks to Londa and Dharwad. Somehow we managed to get into our bays and settled down. Since the train came with bankers attached, we moved off in about 5 minutes. Slowly and with absolute lack of any urgency we curved and meandered all our way to Sonalium for a short halt. We were sitting on the waterfall side of the train and wanted to take one last look at DDS before settling down for the long journey back. Slowly we entered tunnel 13 , tunnel 12 with water falling all over the place. 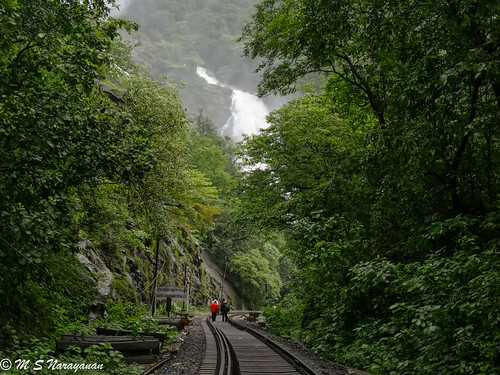 The deafening roar of the falls slowly took over the sounds of the train and there we were watching in awe again at the natural beauty. In a matter of seconds we crossed tunnel 11 and the train came to halt at DDS station. 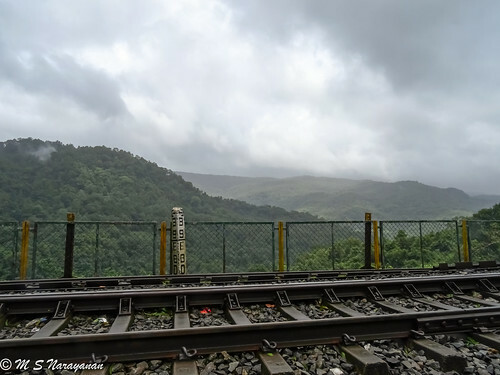 Our initial plan was to board the train from DDS on our way back and one look outside the train made me shiver that we were lucky enough not to make that decision. The place was crowded like a pilgrimage spot during peak season. 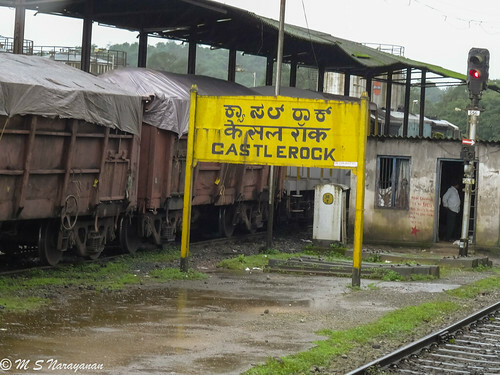 There were easily around 700-800 folks waiting beside the tracks to take this last train towards CastleRock / Londa. I was absolutely sure that many would miss the train. To my surprise, I found a railway employee with red / green flag and a walkie talkie and 2 RPF guiding the people to help board the train. The last 100-200 were unable to find a place in the train and the RPF asked them to board the bankers.After thoroughly checking that people were hanging in a relatively safe position, our walkie talkie guy talked into the device and waved the green flag. Next stop Castle Rock and a good amount of crowd reduced. The train is now occupied only twice to its capacity. A short halt, bankers detached and we were off to Londa where a majority of the crowd deboarded and the train became more or less normal. 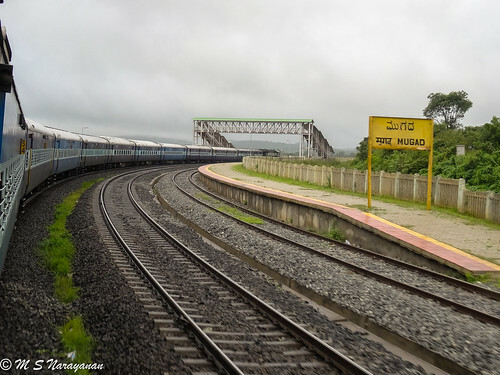 We were detached from Goa express, taken out of PF2, brought back to PF1, Hubli- Nizamudding attached to Goa express on PF2, Goa express left, Waited for Rani Chennamma, Rani Chennamma arrives, taken out of PF1 again, brought back and attached to Rani Chennamma and off we went towards Dharwad / Hubli. 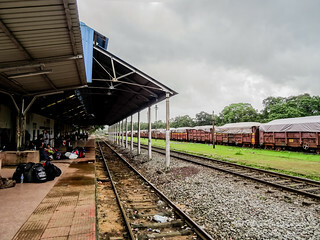 Someone remarked “Arey Londa ke baadh yeh stations itna jaldi kyon aa rahi hai” while the Railways were playing Jigsaw with us. A good sleep and woke up to an absolutely beautiful morning @Hubli. I had always wanted to see this place and gotta admit that I have never seen a cleaner station in IR network. The million dollar question was whether to have breakfast at the station or should I eat what I got. Finally decided to eat my own breakfast to reduce the carrying load a bit. 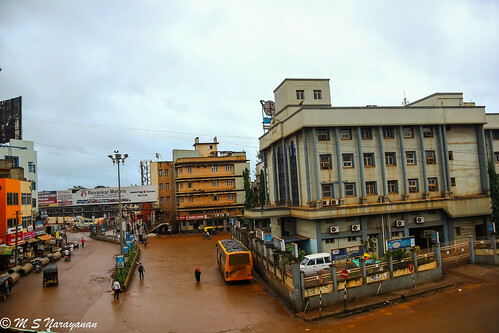 Well, just after we left Hubli, the same questions arose as to what is it we are gonna do. The train was running around 40 mins late and trekking from CLR to DDS meant that we would reach DDS only around 4 PM in the evening. It was then that I received the call from my Pune counterparts who were waiting for us at Londa. There were 11 of them and 16 of us. All 27 needed a place to stay for the night. We all wanted to trek to DDS from CLR,but practicality and the crowd in the train ensured that we did not fall for this. After an hour of discussion, it was settled that we will go all the way to DDS and take it forward from there. Now that the next 3 hrs have been taken care of, I decided to doorplate before someone else occupies my seat. 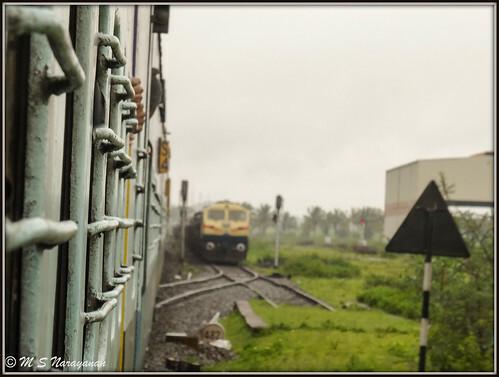 Just as the train moved out from Dharwad, I took to the door and it was a visual treat. Lush green outdoors with ominous looking skies and the Sun peeping out every now and then, added to that the never ending curves. What more could a rail lover need. Absolutely fantastic sight with terrific weather and time just drifted aimlessly. The standout on this section was the station Mugad. One of the most picteresque stations, I have seen. This was one time I wished, I had my SLR while doorplating and not my PS, but hey convenience won this game again. Crawled slowly into Londa. The rest of our gang from Pune boarded the train and the discussion continued. In 5 minutes, we reconfirmed our plans and decided to get down at DDS instead of CLR. Needless to say, the door seat was never compromised and I continued with my blissful experience upto CLR. After seeing CLR in absolutely a million photos all over the web, seeing it live was absolutely fantastic. I somehow felt immediately that I knew this place inch by inch. It was a long halt of around 15-20 mins at CLR. Majority of the trekkers got down here. 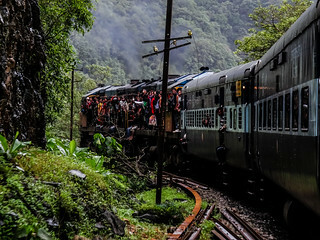 The station was an absolute nightmare to look at with the crowds getting ready for their long 14KM trek and hence I moved on to the other side. Feasted my eyes on a load of DG4’s , brakers attached and all clear given. 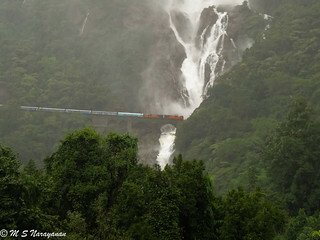 Another 30 minutes and we should be right next to the majestic Dudhsagar right in the peak of the southwest monsoons. 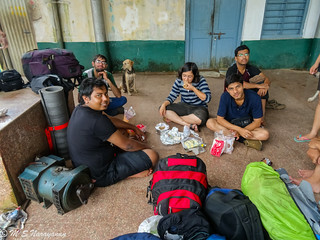 We crawled out of CLR at a leisurely pace, saw the all too familiar board welcoming us to Braganza ghat section, saw the 2 medical relief vans seen all over the web, saw a lot of trekkers en route to DDS who were all too excited to keep waving at us, which was mutually reciprocated, entered the first tunnel, the second and the rest, saw the welcome to Goa board somewhere before Caranzol, sprinkled ourselves with fresh mineral mountain water from numerous falls and the entry and exit points of the tunnel. The train was in absolutely no hurry and took a nice relaxed 20 mins to stop at Caranzol for the brake testing. It was about time we broke from our blissful experience and get ready to de-board at DDS. So off we all went, rain jackets worn, rain trousers worn, food and camera repacked to be made easily accesible, bags packed, sleeping bags packed, tents packed and we were all set to de-board at DDS. 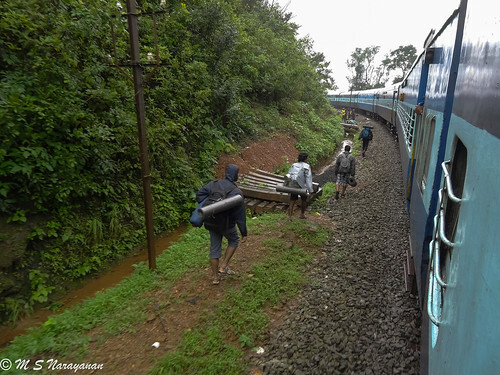 The train stops for a mere 40 – 60 secs and all the 27 of us have to get down with all our baggage. We entered DDS, the already crawling train showed no signs of stopping. Oh God please dont do this. 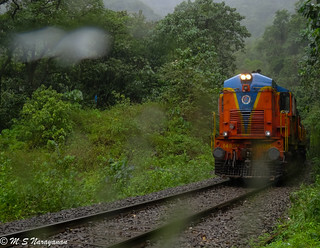 The train kept on with its 15-25 kmph speed and showed no signs of testing its brakes. While we just about gave up hope, the familar squeak of the brakes being applied and bang it stopped. The steps and outside were wet and slippery. Somehow we managed to quickly get down without slipping. 40 secs later (Yes I timed it) the train left on its way towards Kulem. So here I am at DDS station, hardly a KM away from something which I wanted to see for a long time and the excitement was overwhelming. What happens next ? So here I am at DDS, minutes away from witnessing a grand spectacle from the 5th largest falls in India, but somehow did not feel like rushing towards the falls. Why hurry. I have all the time in the world. Let me a bit far from the madding crowd. Watching DDS is just a part of the agenda and not the whole exercise. I asked my colleagues to move on and spent some time just admiring the beauty surrounding me. Steaming hot tea @ DDS seemed like a great idea. Sat down, relaxed, had a refreshing hot cup of chai which was much better than the one served in the train. Stretched my eyes as far as I can see and I could see our Vasco express gliding past Sonalium and a loaded BOXN rake awaiting clearance. So I decided to wait to capture the freight which obviously would be minimum of 2DG4’s in front and 2DG4’s at the rear. Quickly enough, a penta came silently and waited beside me to have a glimpse of the oncoming beasts. What do I say, it was like Sachin waiting to enjoy Viru’s game (When he was at his peak). Ten minutes gone, the twin beasts emerged and scrambled past the penta beasts smoothly. Penta gets an all clear and moves on. I am left now all alone and it was a good 25 mins since I got down. Decided it is about time or my colleagues will just dump me and move on. Just as I entered the tunnel, I realised that my flashlight was with another friend of mine. So much for an expensive flashlight. So well I walked the tunnel in the darkness. 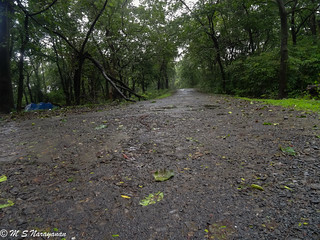 Slippery, wet and oily, it was a treacherous short walk in absolute darkness, but I had nothing to immediately worry about as there would be no trains atleast for the next 60 mins or so. After 5 mins of very careful walk with a few monkeys for company, I saw light at the end of the tunnel. I could also see a faint streak of milky white substance flowing in the distance. The sound of water was slowly getting amplified. Valley overlooking the DDS Falls !!! I could feel a smile breaking and however hard I try to suppress and act with a matter of fact attitude, that thing just could not be wiped out of my face. As I kept nearing the falls, the sound of water gushing increased, the misty sprays started falling on my face, bags and my lenses. 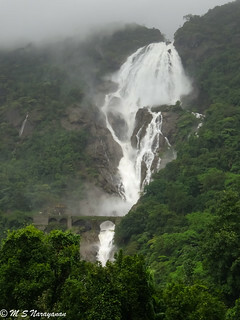 Yes atlast I am here right in front of the majestic Dudhsagar waterfalls, spellbound,awestruck, mesmerised by the strength and beauty of this amazing natural spectacle. I have no words to describe what I saw.No pictures or videos can do any justice to what a person sees here. It is completely out of this world. I stood there right beside the tracks soaking in all the misty sprays and not caring a damn about either of my 2 cameras. This is a moment to enjoy and savor and cherish. Nothing can stop me now. So I just stood there and did nothing for almost 15 minutes. Just watching !!! As I got out of my hypnotic state of mind, the reality bit me real hard. The place was filthy and crowded. Nobody cared a damn. It was filled with plastic bottles, beer bottles, paper plates, plastic cups, styrofoam cups and what not. There was a guy selling liquor at almost thrice the market price. Why do we do this ? Such a beautiful place completely ransacked by a despicable species called human beings. We try so hard to keep our houses clean. Does it take really that hard to take care of our surroundings as well. It is this lack of ownership which pissed me off. But hey, I came here to enjoy and soak in the beauty and not to be philosophical. 1. Nice Swiss Champ Knife with 32 functions. Is it really needed ? 2. Super Fenix Flashlight with 650 lumens output (It lit an entire 15 x 12 room like a fresh and new tubelight). Is this really needed ? In addition to these, I got high end rainwear, footwear, backpack and a whole lot of things which in reality is not an absolute necessity, but well make hay while the sun shines. Got my salary a day ago, but the excitement apparently does not seem to stem from that fact. 24 hrs to start for my long awaited trip, lots of undecided loose ends. We will stay at DDS, but where ? no idea. No idea if we will trek from CLR to DDS. No idea if we will stay at DDS. No idea if we will get a lift to Kulem. Oh no.. forget trek, shall we get down at DDS instead of CLR. Lots of questions, no answers. Well we decided to hell with all, lets all just go home and pack and get ready. It was a hectic day and lots of stuff to buy. We needed food for 2 days and after lots of deliberation, decided that 1 day stock should be enough. Your sub conscious always tells you , “Arrey bhai, just in case” and you always sub consciously listen to the sub conscious and ended up getting food that would last a family for an entire week, some of which are still at home !!. 2 hrs of shopping and 1 hr of planning, I ended up with a list like this. Clothes, Cosmetics, SLR, Point and shoot,Charger for SLR, Charger for PS, Cell phone and charger, Extra batteries for SLR and PS, extra SD cards, RainJacket, Rain trousers, Ankle shoes, regular shoes / sandal, blanket, sleeping bag, medicines first aid, flashlight,swiss knife, loads of food for 2 days, cooking utensil and well what not. Packed them all and found that I would need one more person to carry it for me. So off goes a lot of stuff and somehow managed to pack them all nicely into a single backpack. What really amuses me is that we pack so perfectly and once you start taking out things from your backpack, you find no place to put them back in. Somebody needs a lesson on free energy here. It is 10PM now and all set. I want to sleep. I am desperate to sleep and in the excitement I did sleep around 4 am, when my body could take no more. Still those unanswered questions remained unanswered. Some wild instinct told me it will all fall in place. With that in mind, my body slowly took over my brain and dozed me off to a much needed rest in preparation for an exciting 2 days. 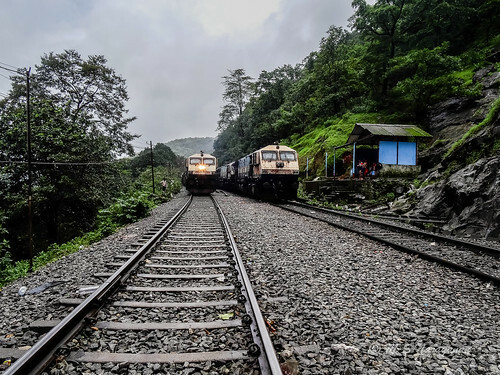 I am a regular traveller on the Bangalore – Chennai – Bangalore line for more than a decade now and I know the pains of travelling on a Friday night to City Railway Station or KJM railway station. It is bumper to bumper traffic all the way from 4:30 pm onwards. 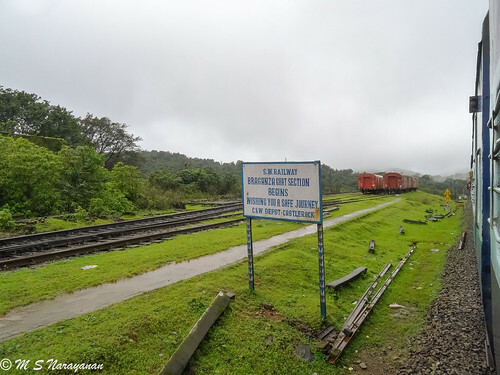 Not wanting to take a chance, I decided to take the opposite direction and board the MAS – SBC ICE from Whitefield till KJM or the MEMU just before that. As luck would have it, even this route was congested and it took me almost one hour to reach Whitefield station, which usually takes around 30 mins. However looking at the opposite direction, I think I made the correct decision. A colleague of mine was stuck up at Hope farm not knowing how to reach Whitefield station. After my expert tips, which included a since you are very late and may miss this last train to KJM, get under the bridge and cross the tracks and the station would be on your right, I assume that my colleague would call me once reached. As time passed and no calls received, I decided to call up and found out that my colleague just dumped me and took the MEMU to KJM, which included an expedition under a stable freight to the other side and not finding the station and a second expedition under the same freight train with a loaded backpack to find the station just in time to board the MEMU and later followed by me unloading a nice helping of my irritation especially on going under the freight train. 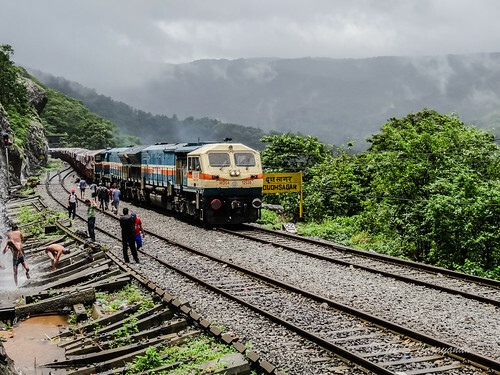 However to get back in the spirit of the travel, it was lost in due course, but I still cannot digest the fact that the freight was crossed twice with heavy backpacks. My ICE came 20 minutes behind schedule and dropped me at KJM PF No 4 where I met the first half of the crew, which is 8 members including myself. 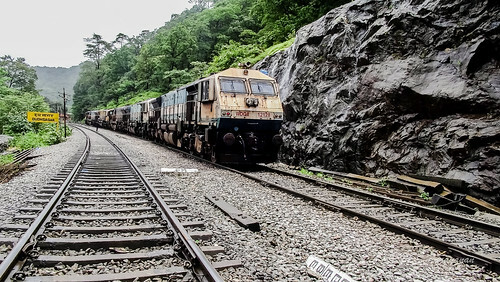 Our short stay at KJM was seen by Sanghamitra, YPR-Howrah and Tirupati-YPR ICE. We left KJM a solid 50 minutes behind schedule led by ED WAP4 and waited at Banaswadi for another 40 mins to let the YPR Puducherry GR to pass. After an eternity which lasted close to around 80 mins we reached YPR a good 30 mins behind schedule. Since we were in the YPR quota coach, we had the entire coach to ourselves upto YPR. As soon as we reached YPR, the entire coach got filled up in a matter of minutes. 64 of the 72 berths were reserved for the people like us who were going to CLR. 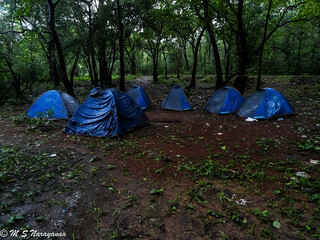 You can imagine the time taken by people to settle down with their tents , backpack , food and sleeping bags. I got my dinner there and surprisingly the Veg Biriyani was quite good. 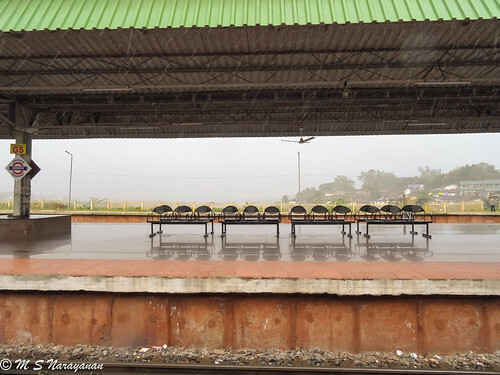 By the time we could all settle down, the train was all set to take us towards Tumkur and was already moving out of the platform. We decided to run through the train end to end and returned in 30 mins just to figure out that there were around 400 folks in the train going to DDS and almost 100 of them wanting to pitch up the tents at DDS and our unanswered questions came back to haunt us again. Another 30 mins of indecision and we decided to retire for the day as it will be a hectic day tomorrow. 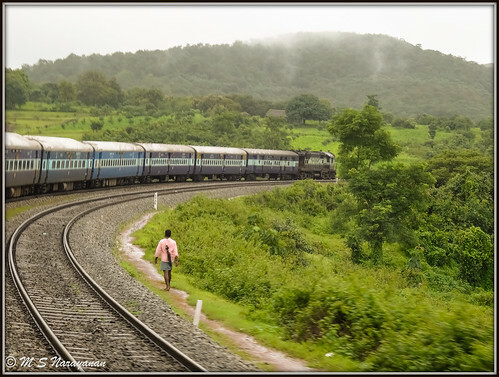 So once again as the train accelerated past Tumkur, I slept with the same unanswered questions, but the wild instinct remained.